The government has persisted with the decision to strip $1.9 billion from public schools in 2018 and 2019, yet managed to find $65 billion for corporate tax cuts. In addition, the Turnbull government has failed to deliver any additional resources to implement the recommendations of the recently released second Gonski review. This leaves 87 per cent of public schools below the national schooling resource standard by 2023, a benchmark the first Gonski Review said all schools needed to be funded to. Over the next decade, $17 billion dollars will be lost to schools. These funds matter for every child and are crucial to providing learning extension, or additional support for children who need it. To rub salt into the wound, public schools will receive zero Commonwealth capital funds for much-needed new and upgraded classrooms, while private schools will reap the benefits of Turnbull’s $1.9 billion capital fund in addition to their recurrent funding. The Federal Budget also provided an additional $250 million funding for school chaplains over the next four years and failed to restore the option for schools to appoint non-religious welfare workers. These funds are desperately needed in our schools to provide professional school counselling services, ongoing professional development for principals and teachers, and student wellbeing programs. The TAFE sector in Australia is in crisis, with successive Australian governments failing to address systemic under-funding and recent market “reforms” throwing the future of TAFE into doubt. This Budget fails to restore more than $177 million in cuts made in the 2017 Budget. This results in a cut to VET of 3 per cent in real terms over the next three years. 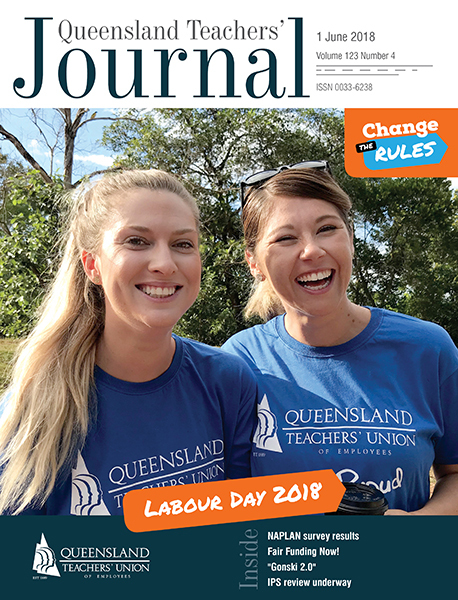 The QTU wants the Turnbull government to commit to a minimum of 70 per cent of all vocational education funding guaranteed for TAFE and for the government to reverse its cuts to the sector. Australia continues to under invest in early childhood education by international standards. The OECD’s “Education at a Glance” reveals Australia’s investment accounts for just 0.5 per cent of GDP, compared to the OECD average of 0.8 per cent. A recent independent national review of early education, commissioned by state and territory governments, called for permanent funding for quality early years programs for all three and four-year-old children. Despite this, the Turnbull government has yet again cast a shadow of uncertainty over the early childhood education sector by only committing to funding for 2019, instead of permanent funding.